March 2012, Grace Exhibition Space, Fountain Art Fair NY at The Armory. “Sometimes you put walls up not to keep people out, but to see who cares enough to break them down.” Living in the world of survival has us guarded, protected by a tough shell, and terrified of being vulnerable with others. ‘The Wall Between Us’ explores the human emotion of discovery, despair and defeat - of love. Script: A couple sits face to face at a restaurant table with a wall literally between them. The setting includes a table, bottle of wine, and centerpiece that have all been divided in half by this separating wall. Through conversation, the couple attempts to get to know each other, yet this wall is preventing from seeing one and other. 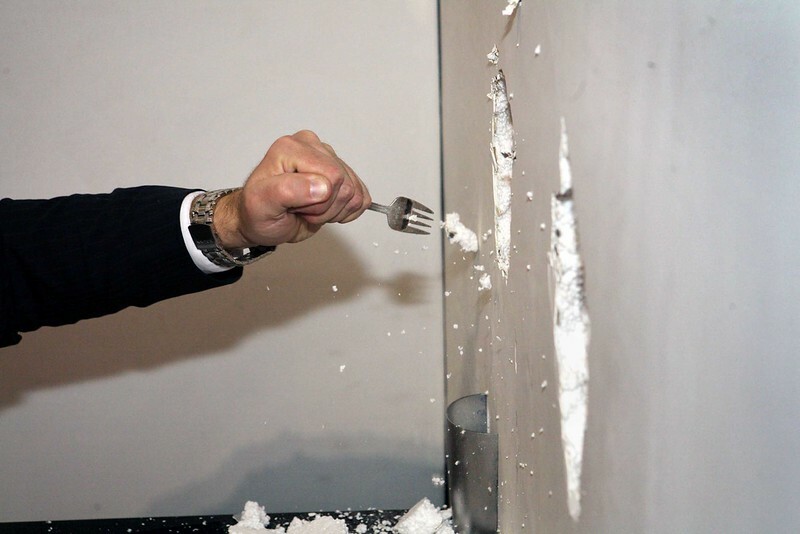 Throughout the date they start to chip at the wall in front of them with their utensils. As the performance progresses, they become desperate to break through, and come to the realization that they are not really with the other person. They start to use their utensils a little less for eating, and more for chipping. Eventually they begin breaching through. A hole is created and their hands touch. Finally he has a grasp on her and refuses to let go. They begin to believe they are finally with the other person and frantically continue to break thru the wall at different locations. Eventually they are able to see each other. He reaches thru, gently touches her face, and in that magical intimate moment, fear overcomes him and he walks away. In despair and defeat, she puts her head down as her hands stay hanging thru the wall without anyone to hold. He hesitates in leaving; returns back to be with her, yet ultimately decides to go on his way.